Major breakthrough in calligraphy pen design! Unique parallel plate structure achieves a more beautiful and sharper handwriting than existing calligraphy pens. 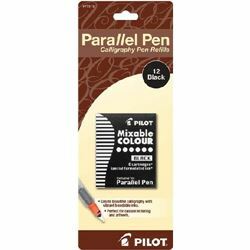 Mixable colors-simply touch the nibs of two Parallel Pens together to create beautiful color graduations.